While I continue with 2012 full year analysis, good news come from troubled European market. Fiat latest product, the 500L, seems to take off. And this time is not only a matter of Italy: the small MPV had record numbers in France and Spain, while it did quite well in Slovenia, Denmark and Greece. For my latest analysis I took the 14 usual countries in Europe where is easy to get data: Czech Republic, Denmark, France, Germany, Greece, Ireland, Italy, Netherlands, Poland, Romania, Slovenia, Spain, Sweden and Switzerland. I also consider sales registrations for the Fiat 500L against Citroen C3 Picasso, Ford B-Max, Hyundai ix20, Kia Venga and Opel Meriva. If Italian numbers are included, then the Fiat is the best-selling small MPV in January 2013. 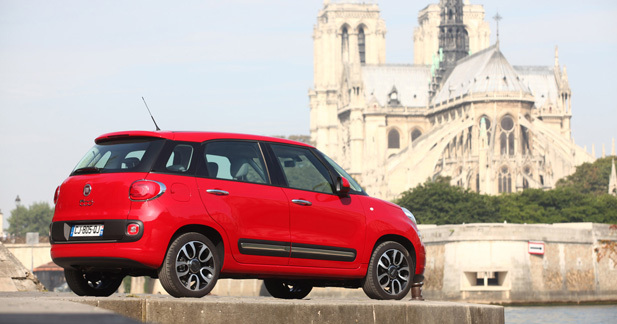 Without Italy, the 500L is the winner in Denmark, Greece and Slovenia. The results are even better if preliminary results for February are included: 1.079 units were sold in France (only 1 thousand units behind the leader, the C3 Picasso). France’s jump is also 1.200 units behind Italian registrations for the same month. As the car was introduced some months ago, it may not be possible that a big part of this result comes from Fiat France self purchases. Spain is also part of the success: in February 2013 the Fiat 500L was the best-selling B-MPV, doubling its immediate competitor. If Fiat makes to maintain these results, the success will come for sure, as more versions and engines of the 500L are still to come. As I did last year with the monthly sales analysis of Fiat 500/Panda vs. VW Up!/Seat Mii/Skoda Citigo (2012 full year analysis is about to arrive), this year I will focus on the evolution of the 500L against those rivals in those markets. 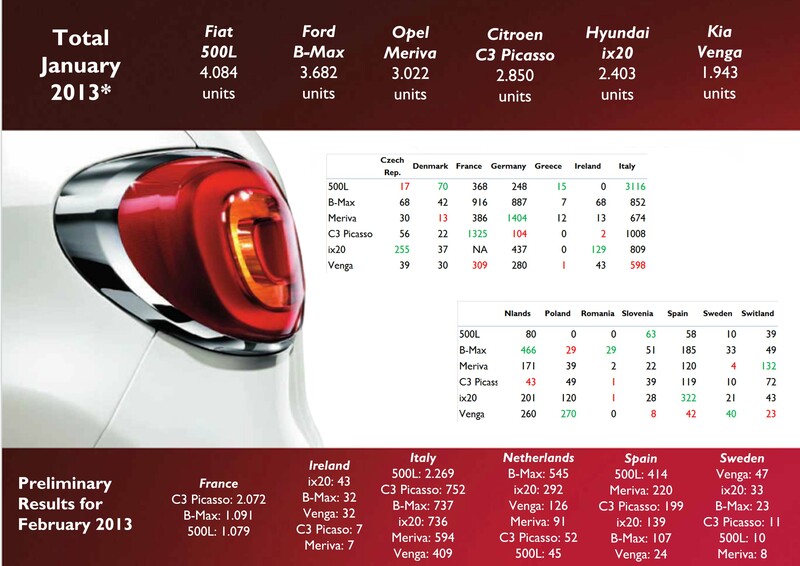 It won’t be easy as the 500L and C3 Picasso’s figures are not separated from their brothers (500 and C3) results in Germany and Sweden, and French rankings don’t always include the low selling cars. The situation gets worse in Italy, France and Germany. Italian car market is down more than 17% in January and February, which means that the strong fall of last year doesn’t stop yet. In France, a double-digit fall in both months, worries as things don’t seem to get better soon. But Germany worries the most: it started the year with -8.6% change (one year ago the market fell 0.4%) and in February 2013, total market fell 10.5%, which is very bad for the largest market in Europe. If Spain is added to this terrible scenario, things get even worse as sales declined 9.6% in January and 9.9% in February. In other words there were 141.675 fewer cars sold in these 4 markets in January-February 2013, compared to Jan-Feb 2012. It means that in the first 2 months of this year the 4 largest car markets fell 12.5%, compared to -7.8% for 2012 full year in EU + EFTA countries. Fiat group did a bit better than the market thanks exclusively to Fiat brand, which fell less than total market in Italy, Germany, France and Spain. In Italy, brand’s registrations fell 8% in the first two months, against 17% of total market. The same situation for France: -3% for Fiat brand vs. -14% for total market. In Germany, Fiat brand fell as much as the market in January: -8.5%. In Spain the brand increases its sales numbers 1.5% while total market falls 9.7%. But as it worked with Fiat brand, it didn’t work with Alfa Romeo and Lancia, which had terrible results in all markets. I think in UK will be a leader soon! Thanks for your comment. I will be back soon.